Canada Postponements, Extensions & Releases . Download the Forms Quickly. Various debt related postponement, exetension and release forms including loan extensions and postponement of debts. Postponement of Claims Agreement (Canada) Agreement where a creditor of a corporation agrees not to be repaid on any claims until another creditor is repaid. Postponement of Debt Agreement (Canada) Agreement where a creditor of a corporation agrees not to be repaid on a specific debt until another creditor is repaid. Postponement of Debt Agreement - Interest Payments Permitted (Canada) Agreement where a creditor of a corporation agrees not to be repaid on a specific debt until another creditor is repaid. Release of Interest in Security (Canada) Agreement where a secured party releases his interest in an asset so that the debtor may sell it. Unlike other sites, every document on FindLegalForms.com is prepared by a lawyer, so you can be sure that you are getting a form that is accurate and valid in Canada. Our team works tirelessly to keep our products current. As the laws change in Canada, so do our forms. After you place your order, your forms will be available for immediate download. You can save the file for later use or print it immediately. We make all formats available to you at no extra charge. In over 10 years of creating and selling legal forms, our focus has never changed: providing our customers high quality legal products, low prices and an experience that takes some confusion out of the law. If you are unhappy with your form purchase for any reason at all, contact us within 60 days and we will refund 100% of your money back. Do I need special software to download or view the documents? No. Standard computer software will allow you to download the forms. In addition, we will send you an email with download links should you need to download your forms on another device. Almost all the documents are provided in multiple formats including PDF, Word, and RTF - ensuring that you will be able to view and edit the document. Can I use the form more than once? Yes. You can use the forms for your personal or business use as many times as you wish. 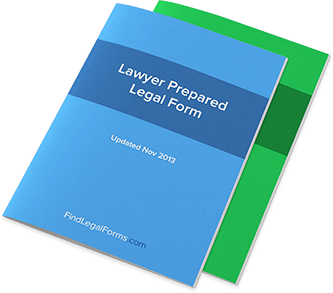 You may not, however, redistribute or resell the forms without the permission of FindLegalForms.com. When can I download my form? Immediately. As soon as your payment is processed you will be taken to a "Thank You" page which contains the download links for the forms that you ordered.